New research from Personal Capital 2019 Financial Trust Report identifies the importance of fiduciary responsibility for todays advisors. Read the report here. SILICON VALLEY, Calif. – Nearly half of Americans surveyed (48 percent) mistakenly believe all financial advisors are required by law to always act in their clients’ best interest, according to new data from leading digital wealth manager Personal Capital. In its 2019 Financial Trust Report, released today, Personal Capital also revealed that 65 percent of investors who work with a financial advisor incorrectly believe that financial advisors only make recommendations that are in a client’s best interest, an increase from 46 percent in 2017. These findings come on the heels of a years-long public debate between regulatory bodies over the fate of the fiduciary rule that has centered around arguing the definition of “best interest,” which may be contributing to the increased public confusion. Investors may expect that some financial advisors have bad intentions, but they assume that they won’t be the ones exploited by bad actors. While nearly one in three Americans surveyed (30 percent) think a financial advisor is likely to take advantage of a consumer, almost all (97 percent) trust that their own financial advisor will act in their best interests. Underscoring the lack of awareness around advisors’ legal obligations to their clients, nearly one in five investors surveyed (18 percent) were unable to identify if their advisor is a broker/dealer or a fiduciary. The 26 percent who indicated their advisors are broker/dealers should reconsider whether they are receiving unbiased financial advice. 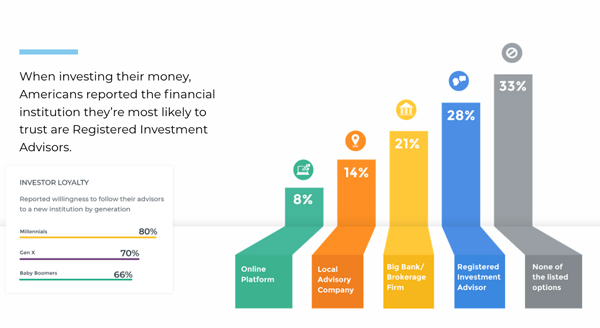 When investing their money, the survey found Americans are most likely to trust a Registered Investment Advisor (28 percent), followed by a big bank/brokerage firm (21 percent), a local advisory company (14 percent) and an online platform or mobile application that offers financial advice (8 percent) with their money, though one in three Americans wouldn’t trust any of the listed options. The survey also showed that investors are more loyal to their advisors than their financial institutions. Seventy-one percent of investors indicated they would move with their financial advisor if he or she switched institutions after the institution was involved in a scandal. In what some may find a surprising twist, Millennials proved to be the most loyal, with 80 percent indicating their willingness to follow their advisors to a new institution, versus Gen X at 70 percent, and Baby Boomers at 66 percent. Investors still aren’t informed enough about the fees they pay on their investment accounts. The number of American investors who know the amount of fees they pay on all their investment accounts has risen slightly – up to 44 percent from 39 percent in 2017 – but still comprises less than half of the population. Furthermore, one in five clients (20 percent) reported not knowing how their financial advisor is compensated. Hidden fees can add up to more than $400,000 in an investor’s lifetime, Personal Capital found in its 2017 study examining advisory fees and fund fees at some of the nation’s most well-known firms. Most Americans (78 percent) think the widespread adoption of technology within financial services is a positive development, claiming that convenience (74 percent), ease of use (69 percent) and its ability to help them better understand their finances (44 percent) are the top benefits of fintech. While all generations agree technology in financial services is overwhelmingly positive, apprehension increases with age. Eighty-seven percent of millennials view fintech positively, but the number decreases slightly to 79 percent for Gen X, and 72 percent for Baby Boomers. For the remaining 22 percent of Americans who view the widespread use of fintech negatively, the top issue is cybersecurity concerns (69 percent), with preference for traditional financial interactions coming in a distant second (46 percent). The concern around cybersecurity, it seems, may be more hypothetical than based on reality, as nine in 10 investors who see a financial advisor (92 percent) reported to believe their personal and financial information is safe with their financial institution. Personal Capital is a hybrid digital wealth management company that offers free financial planning tools for investors and fee-based wealth management services. Personal Capital is headquartered in Silicon Valley with hubs in San Francisco, Denver, Dallas, and Atlanta. 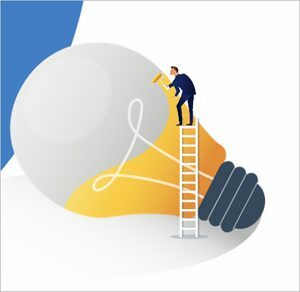 Connect with us on Twitter, LinkedIn or Facebook. For more information and to open an account, visit https://www.personalcapital.com/. This report presents the findings of a CARAVAN survey conducted by Engine among a sample of 2,007 adults comprising 1,004 men and 1,003 women 18 years of age and older. These online interviews took place December 10-16, 2018.